Use our web application below to view your calendar and setup collection reminders to your email! Once you log in and provide your location, you can easily view your calendar and service schedule. If you do not use a smartphone, or wish to have the mobile application, this web app will provide all the same information. Download the mobile app to your smartphone for instant collection reminders and more! 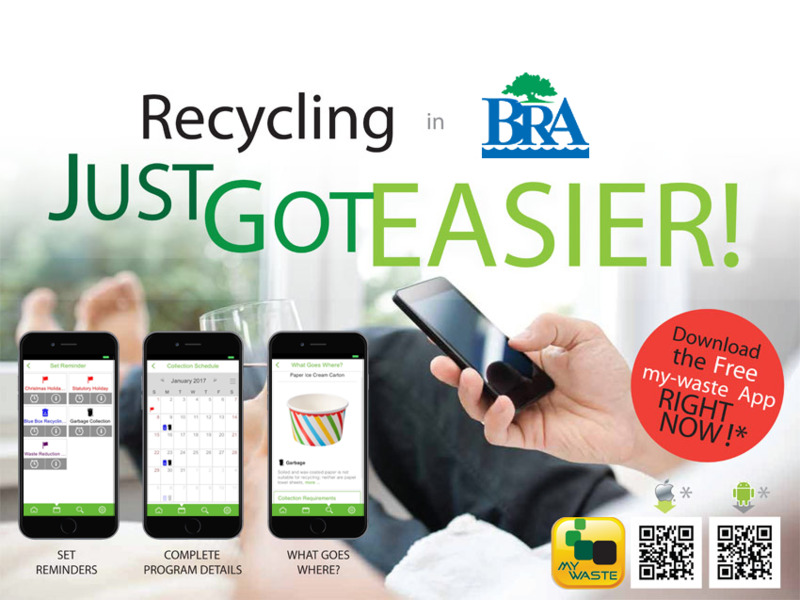 You can download the Association's my-waste App to get instant access to all the waste collection schedules that happen in your neighbourhood and in our community. Once you've got my-waste, set up alerts easily to remind you that recycling collection is coming up or that a special e-waste day is taking place at a nearby location. Never miss another collection day for garbage, recycling, yard waste, household hazardous waste and electronic waste and more. By selecting your collection zone, you'll have all this information at your fingertips 24/7. Special collection days for bulky items, household hazardous waste, e-waste and more. Hours of operation and locations for depots, transfer stations and landfills. Don't have a smartphone or tablet? No problem. We'll continue to provide information through this website and by sending out printed schedules. We have developed a small movie for you to enjoy and watch while installing and configuring your mobile app. It couldn't be easier! Click on the YouTube video above.